For fast-paced casino action, the Palace lives up to its name! There’s a kingdom of fun awaiting you at the Palace Casino. Enjoy more than 700 slot machines on two floors, 20 table games, a Poker room, and a beautiful High-Limit Lounge. It’s always a great time when you visit the Palace and you’ll love our friendly and attentive service. Located on the second floor of Palace Casino, Aces Grill is a great place for breakfast, lunch, dinner or even a late-night bite. Aces Grill features a variety of favourites to suit your taste. Our breakfast menu includes all the traditional fare such as eggs benedict along with our chef’s own breakfast sandwich. At lunch, try one of our delicious salads, sandwiches or burgers. The fantastic dinner menu showcases prime rib, steaks, pasta, and pizza plus an assortment of mouth-watering appetizers. Stay and play your way! 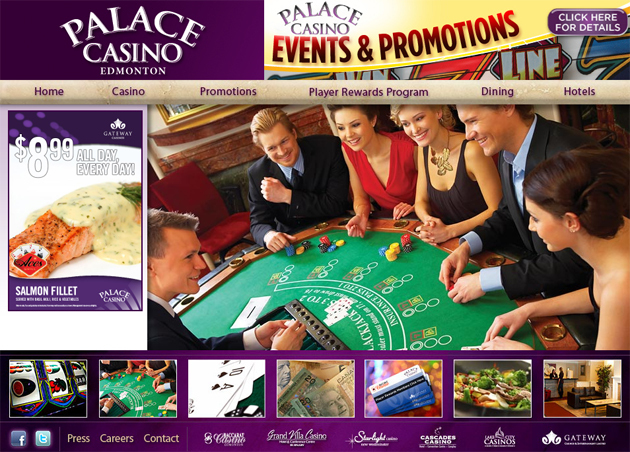 The Palace Casino is pleased to be partnered with a number of first-rate hotels. Bus tour and group packages are available – we can accommodate your group for an exciting night of casino play. You’ll get gaming coupons and gifts for everyone in your group.